hurrah ! no need for reindeer ! 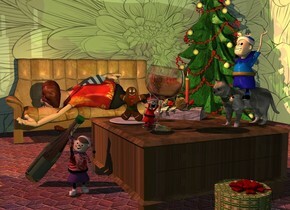 a table.a control panel is on the table.a first elf is in front of the table.the first elf is facing the table.a second elf is right of the first elf.the second elf is facing northwest.a third elf is left of the first elf.the third elf is facing northeast.a sleigh is 15 feet behind the table.the sleigh is facing left.the sleigh is -3.5 feet left of the table.the sleigh is 6.5 feet above the ground.the sleigh is facing southwest.the sleigh is red. [christmas] ground.the ground is 100 feet tall. 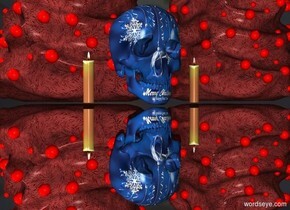 [christmas]skull.a first red christmas tree is 1 feet behind the skull.silver ground.a second red christmas tree is right of the first tree.the sky is dark.a first candle is 2 inches left of the skull.a second candle is 2 inches right of the skull. 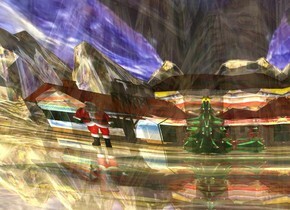 a clear white face down eagle ray.a[paint] building is 100 feet behind the ray.the building is facing southwest.the ground is 210 feet tall.the building is shiny.the ground is art.the ground is shiny.a christmas tree is 50 feet in front of the building.a man is 6 feet left of the tree.a white light is 1 feet in front of the man.[light]sky. a 1st 2 foot tall squirrel is facing right. it is 0 inches above a [leaf] floor. a 2nd 2 foot tall squirrel is 1 foot to the right of the 1st squirrel. the 2nd squirrel is facing the 1st squirrel. 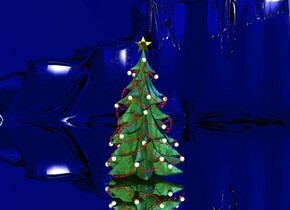 a christmas tree is 0 inches above and -8 feet behind and -9 feet to the right of the floor. a [forest] wall is -.1 inch behind the floor. 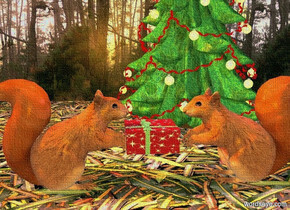 a 6 inch tall present is -1 inch to the right of the 1st squirrel. it is .8 foot over the ground. the ambient light is dim linen. the camera light is gold. a copper light is 1 inch over the 1st squirrel. a mauve light is 1 inch over the 2nd squirrel. the sun is dim copper. It must be this way ! 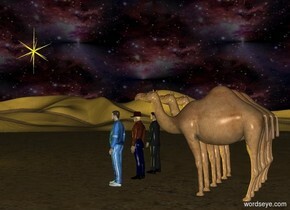 a first camel.a second camel is 6 inches right of the first camel.a third camel is 6 inches left of the first camel.a first man is 1 feet in front of the first camel.a second man is 1 feet in front of the second camel.a third man is 1 feet in front of the third camel.a 5 feet tall yellow north star is 10 feet in front of the first man.the star is 10 feet above the ground.the sky is texture.the texture is 1000 feet tall.the sun's altitude is 90 degrees.a yellow light is 20 feet in front of the first man.the sun is black. a 20 feet tall silver coffin.the coffin is 20 feet long.a 3 feet tall yellow north star is -10 feet above the coffin.a yellow light is 1 feet above the star.a blue light is 1 feet beneath the star.a red light is 1 feet right of the star.a green light is 1 feet left of the star. nice tree , Timothy ! 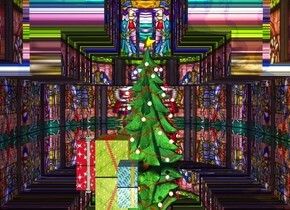 a 30 feet tall silver cube.a christmas tree is -30 feet above the cube.a green light is 2 feet in front of the tree.a blue light is 1 feet above the tree.a man is 1 feet right of the tree.the man is facing southwest.a first box is right of the tree.a red light is 1 feet behind the tree.a yellow light is 1 feet left of the tree.a second box is left of the tree.a third box is left of the second box.a fourth box is 1 feet behind the tree.the ambient light is old gold.a bed is 2 feet behind the tree.a boy is -42 inches above the bed.a box is -25 inches above the bed. The ground is 80 feet deep and 1000 feet long and 150 feet high. It is clear. A huge [Christmas] dinosaur is on the ground. A huge silver building is -100 feet in front of the dinosaur. A man is behind the dinosaur. An elf is 20 feet left of the man. 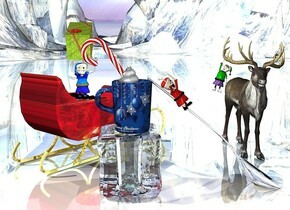 A large present is in front of the elf. An elf is 30 feet left of the elf. A red light is left of the elf. A large decoration is 5 feet above the elf. 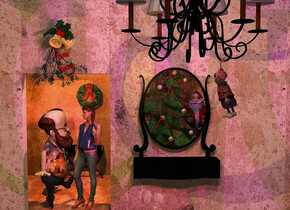 A huge decoration is 2 feet behind and -2 feet above the decoration. A large present is right of the elf. A large present is on the present. An elf is 10 feet right of and -1.5 feet behind the elf. A present is in front of the elf. An elf is 5 feet left of and 2 feet behind the elf. A present is left of the elf. A small present is behind the present. 10 lights are above the dinosaur. The sun is silver. a large Christmas tree is 64 feet in a [Church] church. it is 0 inches over a gigantic silver floor. 2 gold lights are 1 foot in front of the christmas tree. a 1st very large present is to the left of the christmas tree. a 2nd very large present is in front of and -.7 foot to right of the 1st present. a 3rd very large present is in front of and -.8 feet to the right of the 2nd present. the ambient light is mauve. a dim lemon light is over the christmas tree. a first snowman.a second snowman is 1 feet left of the first snowman.the second snowman is facing southeast.the first snowman is facing southwest. 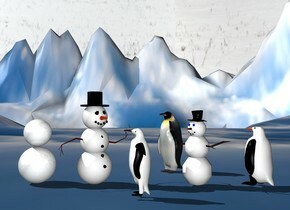 [snow]ground.the ground is 175 feet tall.a first penguin is 1 feet behind the second snowman.the first penguin is on the ground.the second snowman is on the ground.the first penguin is 2 inches right of the second snowman.a second penguin is 6 inches in front of the first snowman.the second penguin is facing north west.the second penguin is 2 inches left of the first snowman.a third penguin is right of the first snowman.the third penguin is facing the first penguin.a dull 2 feet tall white sphere is left of the second snowman.a dull 1.5 feet tall sphere is on the 2 feet tall sphere.the first penguin is facing southwest.[winter]sky. a 1st polar bear. a 1st big shiny gold ornament is in front of the bear. it is 5 feet over the ground. it is leaning 90 degrees to the back. a 2nd big shiny red ornament is -1.2 inches to the left and -3 inches above the 1st ornament. it is leaning 90 degrees to the back. a 3rd big shiny green ornament is -1.2 inches to the right and -10 inches above the 1st ornament. it is leaning 90 degrees to the back. a 4th big shiny blue ornament is -1.2 inches to the right and -10 inches above the 3rd ornament. it is leaning 90 degrees to the back. a 5th big shiny gold ornament is 3.5 feet over the ground. 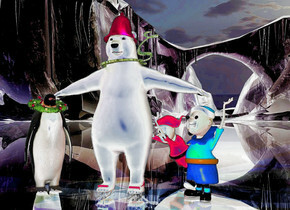 it is in front of the polar bear. it is 1 inches to the left of the 2nd ornament. it is leaning 90 degrees to the back. a 6th big shiny blue ornament is -1.2 inches to the right and -10 inches above the 5th ornament. it is leaning 90 degrees to the back. a 7th big silver ornament is -1.2 inches to the right and -10 inches above the 6th ornament. it is leaning 90 degrees to the back. a 8th big shiny red ornament is -1.2 inches to the right and -10 inches above the 7th ornament. it is leaning 90 degrees to the back. a 9th big shiny gold ornament is -1.2 inches to the right and -9 inches above the 8th ornament. it is leaning 90 degrees to the back. a 10th big shiny green ornament is -1.2 inches to the right and -8 inches above the 9th ornament. it is leaning 90 degrees to the back. 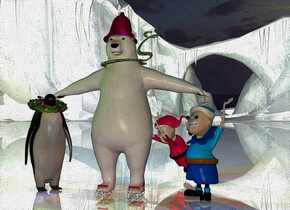 a 2nd 2.6 foot tall polar bear is -2.4 feet to the right of the 1st polar bear. it is facing the first bear. it is leaning 5 degrees to the back. 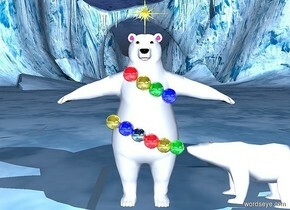 an 11th big shiny gold ornament is -2 inch above the 1st polar bear. it is night. a light is one inch in front of the 11th ornament. the ambient light is baby blue. a shiny [christmas] whale. 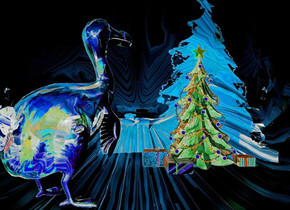 a 5 feet tall shiny [christmas] dodo is -15 feet left of and -30 feet in front of and -10 feet above the whale. it is facing southwest. a 1st red light is right of the dodo. a 2nd white light is left of the dodo. the camera light is black. a 3rd blue light is 10 feet left of the dodo. 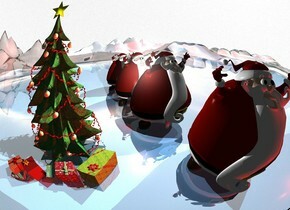 a 5 feet tall dull christmas tree is 0.5 feet left of and 1 feet in front of the dodo. a 0.7 feet tall 1st dull christmas present is right of the christmas tree. a 0.4 feet tall 2nd dull christmas present is behind and -0.1 feet left of the 1st christmas present. a 0.4 feet tall 3rd dull christmas present is left of the christmas tree. what ! 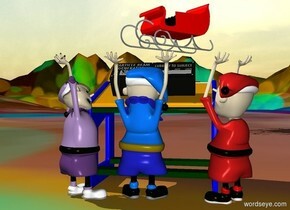 those little *** elves ! [rot]window.a first elf is 10 feet behind the window. 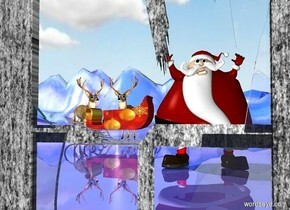 [paint]ground.the ground is 100 feet tall.shiny ground.a [christmas]sleigh is 10 feet behind the first elf.the sleigh is 2 feet left of the first elf.the sleigh is facing left.a first deer is 6 inches behind the sleigh.a pink light is in front of the first deer.a second deer is left of the first deer.the second deer is facing southeast. and you thought there was only one ! 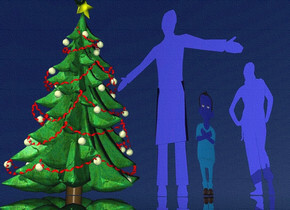 a christmas tree.a first box is in front of the tree.a second box is 2 inches right of the first box.a third box is 2 inches right of the second box.the third box is facing southwest.a fourth box is 2 inches left of the first box.the fourth box is facing southeast.a fifth box is 2 inches right of the third box.a sixth box is on the fifth box.the sixth box is facing southeast.a 15 feet tall silver ornament is 2 feet in front of the tree.a man is 2 feet left of the tree.a first elf is in front of the man.a second elf is behind the man. [snow]ground.a red light is 2 feet in front of the first elf.the first elf is facing southeast.a third elf is 12 inches behind the second elf. [snow]sky.shiny ground.the ground is 80 feet tall. the man is 8 feet in the first christmas tree. he is -3 foot in front of the tree. the ground is shiny white. the 6 christmas trees are 7 feet in front of the first christmas tree. the large dog is -1.5 foot to the right and behind the man. it is facing back. it is leaning 20 degrees to the right. the boy is 15 feet in front of the man. he is facing back. the large yellow circle is -2 feet to the right of the man. 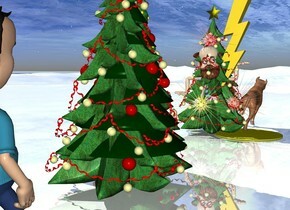 1st sun symbol is -27 inches in front of the 1st Christmas tree. 2nd red sun symbol is -1.7 feet above the man. 3rd copper sun symbol is -2.8 feet right of the man. 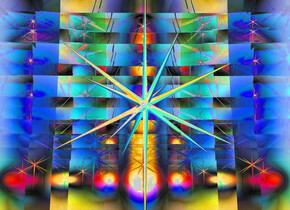 a 6 feet tall lightning bolt is -1.5 feet above the 3rd sun symbol. a wood coffee table. the ground is tile. 1st 15 feet tall and 20 feet long [pattern]wall is 7 feet behind the table. 2nd 15 feet tall and 20 feet long [pattern] wall is -0.2 feet in front of and -0.8 feet to the right of the 1st wall. it faces left. a [pattern] sofa is 0.1 feet in front of the 1st wall. a man is -3.1 feet above and -5.8 feet to the left of and -2 feet to the front of the sofa. he faces left. he is upside down.he leans 13 degrees to the left. the shirt of the man is [holiday]. a large wine glass is -1.2 feet to the front of and -1.2 feet left of and -0.1 inch above the table. it leans 10 degrees to the southwest. a large wine bottle is 0.3 feet left of and -3.3 feet to the front of the table and -0.07 feet above the ground. it leans 43 degrees to the southwest. a [spotted] cat is -1.5 feet to the right of and -1.2 feet to the front of and -0.06 feet above the table. it faces the wine glass. the liquid of the wineglass is clear coral. a 1.3 feet tall yule log is -1.8 feet to the back of and -2.3 feet to the right of and -0.03 feet above the table. it faces southwest. a Christmas tree is right of the sofa. 1st small elf is -0.5 feet above and -1.2 feet left of and -0.6 feet to the front of the cat. he faces left. a tiny bell is -0.5 feet above and -0.4 feet left of and -0.1 feet to the front of the cat. 2nd tiny elf is -0.7 feet left of and -0.3 feet to the back of the wine glass. he is -0.3 inch above the table. he faces south. he leans 14 degrees to the southwest. 3rd small elf is 0.2 feet left of and -2.4 feet to the front of the table. the shirt of the 3rd elf is [Christmas]. 1st present is in front of the table. 2nd present is 1.2 feet southeast of the tree. a plate is 5 inches behind the 2nd elf. a gingerbread man is on the plate. the camera light is dim. the sun is dim salmon. a dim chartreuse light is -6 inches southwest of the tree. a amber light is -0.4 feet above the glass. a dim beige light is 2 inches in front of the cat. a large wine glass. a 1st very tiny elf is 3 inches in the glass. it is leaning to the right. a 2nd very tiny elf is -1 inch to the right of the 1st elf. it is leaning to the left. 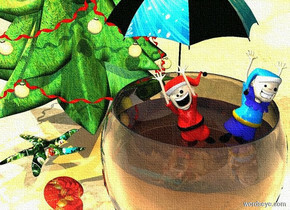 a tiny [christmas] umbrella is behind the first elf. the ground is shiny sand. a small christmas tree is 1 foot behind and -.5 feet to the left of the wine glass. a [christmas] starfish is .2 foot to the left of and .5 feet behind the wine glass. it is facing the wine glass. the sun is cream. a copper light is over the glass. a lemon light is over the umbrella. a small [christmas] seashell is leaning 90 degrees to the right. it is in front of and -1 feet to the left of the starfish. Time to Come In Now, Kids! The ground is 75 feet high. It is 2 feet wide [snow]. 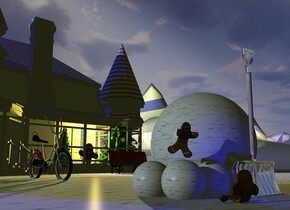 A silver snow shovel is in front of a 3 feet high [snow] sphere. The sphere is -2 inch above the ground. A [snow] sphere is left of the sphere. A [snow] sphere is right of and in front of the sphere. A [snow] sphere is left of the sphere. A [gingerbread] house is 20 feet behind the shovel. A 5 feet tall Christmas tree is -9 feet in front of and -10 feet right of the house. A 9 feet tall Christmas tree is -9 feet in front of and -6 feet right of the house. It is dusk. Camera light is black. A yellow light is -2 inch left of and -6 feet above the tree. A pink light is above the light. A navy light is above the house. A navy light is in front of and left of the shovel. A huge man is 1 inch left of the tree. A man is above the sphere. He is leaning 20 degrees to the front. A man is 8 inches in front of the sphere. He is facing the sphere. He is on the ground. The sun is baby blue. A bench is in front of and -4 feet left of the tree. A bicycle is 10 feet left of and 5 feet in front of the bench. a 50 inch tall flat [IKB191] 1st man.the man is facing west.a 45 inch tall flat [IKB191] woman is 40 inch right of the man. 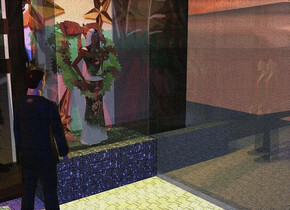 the woman is facing east.a 1st 75 inch tall christmas tree is behind the man.sky is ink blue.ground is clear.ambient light is ink blue.a 30 inch tall flat [IKB191] 2nd man is 10 inch right of the 1st man. don't forget the aged ones ! 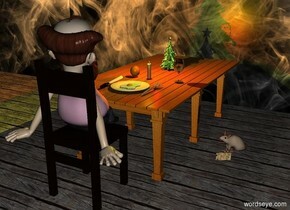 [smoke]wall.a table is 1 feet in front of the wall.a plate is on the table.a chair is in front of the table.a 2.5 feet tall man is -20 inches above the chair.the chair is facing the table.the man is facing the table.the plate is -20 inches in front of the table.a egg is on the plate.a knife is left of the plate.the knife is face up.the knife is facing west.the wall is 40 feet long.a fork is right of the plate.a candle is 6 inches behind the plate.a 12 inch tall christmas tree is 1 feet behind the candle.a dull yellow light is above the candle.a dull red light is in front of the christmas tree.it is night.the ground is wood.a rat is right of the table.the rat is facing southwest.a cheese is in front of the rat.the cheese is facing southwest.a glass is 8 inches right of the candle.a orange is 3 inches left of the candle. a christmas tree. the ground is silver. the sky is ink blue. 3 blue lights are 3 feet above the tree. a baby blue light is 2 feet above the tree. the sun is blue. a white light is 1 foot above the tree. 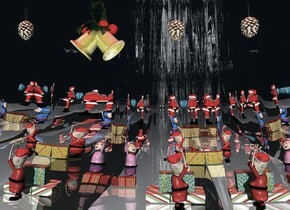 this isn't santa's grotto ! 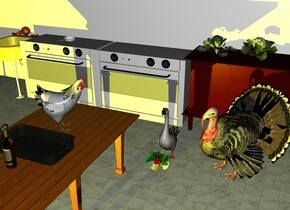 a first oven.a 60 feet tall wall is 2 inches behind the oven.the wall is 60 feet long.it is night.a second oven is left of the first oven.a 3 feet tall buffet is right of the first oven.a first pan is on the second oven.a table is 3 feet in front of the first oven.a second pan is on the table.a sink is left of the second oven.the ground is tile.a turkey is in front of the buffet.the turkey is facing southwest.a goose is left of the turkey.a chicken is behind the second pan.the chicken is facing the turkey.a bottle is 2 inches in front of the second pan.a cauliflower is on the buffet.a broccoli is left of the cauliflower.a yellow light is 5 feet in front of the table.a ornament is in front of the goose. a [wall] fireplace. a 1st wood wall is 0 inches to the left of the fireplace. a 2nd 4 foot tall and 4 foot wide [wall] wall is 0 inches over the fireplace. a 3rd silver wall is 0 inches to the right of the fireplace. 12 very tiny Christmas wreaths are in front of the fireplace. they are 1.8 feet above the ground. a 1st small Christmas stocking is to the right of the Christmas wreaths. it is 1.4 feet above the ground. it is facing back. a 2nd small Christmas stocking is to the left of the Christmas wreaths. it is 1.4 feet above the ground. it is noon. a small [christmas] painting is 0 inches above the fireplace. it is in front of the 2nd wall. the camera light is dim cream. the ambient light is brown red. the sun is dim copper. a small Christmas tree is to the right of the fireplace. it is .5 foot in front of the wall. it is 0 inches above the ground. the ground is tile. 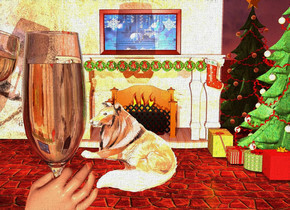 a 1st large wine glass is 6 feet in front of and -2 feet to the left of the fireplace. it is 1 feet over the ground.a tan hand is -4 inch in front of the wine glass. it is facing back. it is leaning 45 degrees to the right. a 2nd large wine glass is 3 feet in front of and -.6 foot to the left of the fireplace. it is 1.2 feet above the ground. it is leaning to the left. 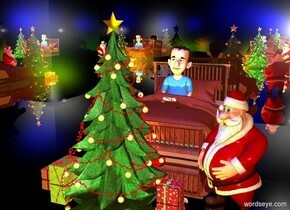 a gold light is to the left of the Christmas tree. a light is -1 inch above the 1st wine glass. a beige light is 3 feet in front of and -6 inches above the hand. a 1st small present is to the left of the Christmas tree. a 2nd small present is in front of and -2 inches to the right of the 1st present. a 3rd small present is in front of and -2 inches to the right of the 2nd present. a 4th small present is in front of and -3 inches to the right of the 3rd present. a 1st small flame is -1.5 feet above the fireplace. a 2nd small flame is to the left of the 1st flame. a 3rd small flame is to the right of the 1st flame. a very small dog is 3 foot in front of the fireplace. a dim peach light is 1 foot over the dog.